ghd has long been hailed as one of the best (if not the best) brand of hair straighteners around. I'd wanted one for ages but eventually put the purchase on hold for what I thought were very practical reasons. Since my hair is naturally straight I figured spending money on a flat iron didn't make much sense, even if it did have additional styling capabilities apart from just straightening. 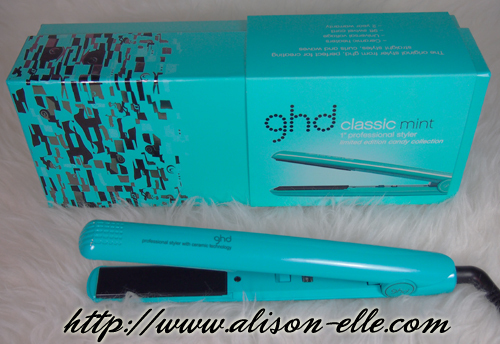 I finally got the chance to check this straightener off my lust list when ghd (which stands for "good hair day") sent me one of their new Candy Stylers. Well, apparently I've been missing out all these years! Inspired by retro sweetshop favourites, the candy collection features the ghd IV styler in three limited edition colours: mint, lemon, and violet. I opted for the mint, which is super cute. While I don't have much personal experience with hair straighteners, I've found the Candy Styler very easy to use. The ceramic plates heat up quickly and the 2.8 metre swivel cord makes handling a breeze. Plus, the curved barrel means you can also use the straightener to curl or wave your hair. I've really been liking the side-swept glamour waves a lot of celebrities have been sporting on the red carpet (for example, Jessica Alba and J. 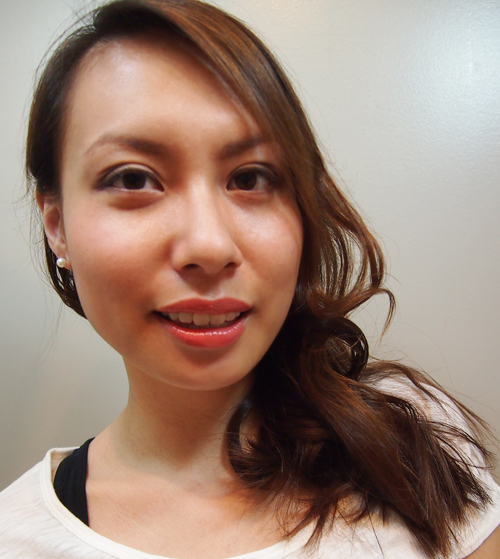 Lo) so I thought I'd put together a tutorial on how you can use the ghd Candy Styler to get a similar look. First, start by combing your hair to get out any knots and spray on a heat protectant (I'm currently using Tresemmé Heat Tamer Protective Spray). Next, take a section of hair and place it in the ghd Candy Styler as if you're about to straighten it. 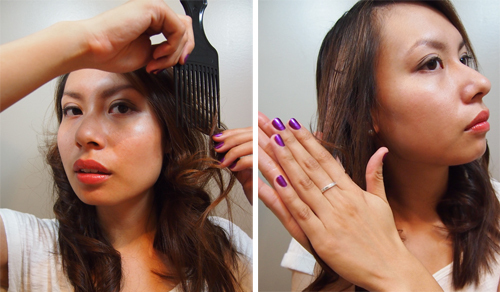 Turn the styler outwards (away from your face), wrapping the hair around it. 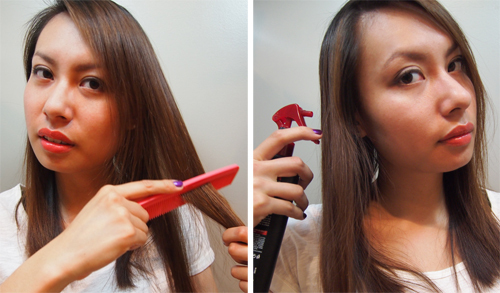 Pull the styler all the way down the length of your hair, creating a curl. This part can be a little tricky but holding onto the ends of the hair as you're turning and pulling helps a lot. Repeat until all of your hair has been curled. Once your whole head is done, brush or comb out the curls (I'm using a pick comb) to create softer waves. Apply a mousse or serum like UNITE Shina Liquid Gloss for smooth, shiny hair and to keep it in place. Lastly, bobby pin your hair to one side and the look is complete! ghd's hairstyles inspirations page has a lot of other great ideas on how the Candy Styler can be used. I can't wait to experiment some more with mine! Nice hair styler! You look great with that hair! It took me a while to get used to as well. I feel like I should give hot rollers another go... I have a set from the 80s, haha! Looks really nice!I have something similar! I've never bought a hair straightener before cause of the same reason as you. I already own a hair curler but even so I'm too lazy to do anything with my hair. You look great with curls though! I find making any curly look so much easier and faster with a ghd/straightening iron , love the tutorial. I love using my hair straightener for waves! How many inches is yours? I think the ideal size is around 1.5 inches I've heard. It's 1 inch so smaller than my curling irons (which are 1.5 inches). I've heard that too about the ideal size! Oh pretty! 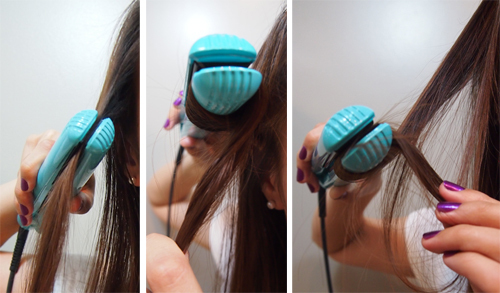 I never thought to use my flat iron in this way! Cute! I have yet to master the whole curling your hair with a straightener thing!